Ukrainian forces killed five pro-Moscow rebels on Thursday as they closed in on the separatists' military stronghold in the east and Russia launched army drills near the border in response, raising fears its troops would go in. The Obama administration has criticised reconciliation between rival Palestinian groups, describing it as "troubling" and a blow to the currently stalled peace process with Israel. Pakistani military jets today pounded terrorists' positions along the Afghan border in the restive Khyber tribal region, killing at least 37 suspected militants and injuring 18 others. The suspected militants were killed as jet fighters carried out airstrikes along with a search operation in various areas of Khyber Agency. An Afghan policeman opened fire today on staff at a Kabul hospital run by a US charity, killing three Americans in the latest deadly attack targeting foreign civilians in the city. The gunman was injured in the incident outside the Cure International hospital and detained by the police, officials said, adding that the motive behind the shooting was not immediately known. Under an international accord signed in Geneva last week, illegal armed groups in Ukraine, including the rebels occupying about a dozen public buildings in the largely Russian-speaking east, are supposed to disarm and go home. But they have shown no signs of doing so and on Thursday the Ukrainian Interior Ministry said its forces backed by the army had removed three checkpoints manned by armed groups in the separatist-controlled city of Slaviansk. "During the armed clash up to five terrorists were eliminated," it said in a statement, adding that one person had been wounded on the side of the government forces. 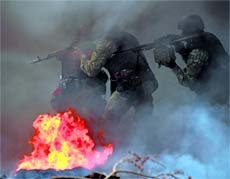 A rebel spokeswoman in Slaviansk said two fighters had died in a clash in the same area, northeast of the city centre. The Kremlin has built up forces on Ukraine's border, estimated by NATO officials at up to 40,000 troops, and maintains it has the right to protect Russian-speakers if they come under threat, a reason it gave for annexing the Crimean peninsula from Ukraine last month. In St Petersburg, Russian President Vladimir Putin said if the authorities in Kiev had used the army in eastern Ukraine, this would be a very serious crime against its own people. "It is just a punitive operation and it will of course incur consequences for the people making these decisions, including (an effect) on our interstate relations," Putin said in a televised meeting with regional media. Reuters journalists saw a Ukrainian detachment with five armoured personnel carriers take over a checkpoint on a road north of Slaviansk in the late morning after it was abandoned by separatists who set tyres alight to cover their retreat. However, two hours later the troops pulled back and it was unclear if Kiev would risk storming Slaviansk, a city of 130,000 that has become the military stronghold of a movement seeking annexation by Moscow of the industrialised eastern Ukraine. At another checkpoint set up by the Ukrainian military, a soldier said they were there to instill law and order. "Those separatists, they violated the constitution, they are torturing the country, they violated laws, they do not recognize the authority of police so the army had to move in and we will finish what we have started so help me God," he said. The Geneva agreement, signed by Russia, the United States, Ukraine and the European Union, was already in trouble as Kiev launched its offensive to regain control of the east. East and West have put the onus on each other to ensure the accord is implemented on the ground. US President Barack Obama said earlier he was poised to impose new sanctions on Moscow if it did not act fast to end the armed stand-off. Putin said sanctions were "dishonourable" and destroyed the global economy but that so far the damage had not been critical. BRUSSELS: The European Union may ban transactions with financial institutions in Crimea as part of its response to the annexation of the peninsula by Russia last month, an EU document obtained by Reuters showed. EU leaders consider the takeover of Ukraine's Crimea by Moscow as illegal and have asked the EU executive arm, the European Commission, to propose economic, trade and financial restrictions on Crimea for rapid implementation. "The timing was troubling, and we were certainly disappointed in the announcement," State Department spokeswoman Jennifer Psaki told reporters on Wednesday. "We all understand it's hard to see how Israel can be expected to negotiate with a government that does not believe in its right to exist," she added. Psaki declined to comment on reporters' suggestions that Palestinian unity created an opportunity for the US to push the peace process back on track since a proposed Fatah-Hamas government would represent all Palestinians. Hamas, which governs the Gaza Strip, refuses to recognise the state of Israel. 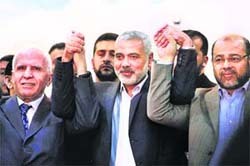 Earlier, Hamas and Fatah, which governs the West Bank, said they had agreed to reconcile and would immediately begin negotiations on forming a unity government. Israel responded to the Palestinian decision by calling off talks with Palestinian Authority President Mahmoud Abbas on moving the stalled peace process forward. Secretary of State John F. Kerry, who has personally invested a considerable amount of energy into West Asia peace, discussed the ramifications of Palestinian reconciliation in a phone call with Israeli Prime Minister Benjamin Netanyahu on Wednesday. Kerry did not speak with Abbas, but his team had been in touch with the Palestinian leadership. Psaki said any Palestinian government must "unambiguously and explicitly" commit to nonviolence, recognition of the state of Israel, and acceptance of previous agreements and obligations. The absence of such a commitment could "seriously complicate" US-backed efforts to extend the Israeli-Palestinian peace negotiations beyond the April 29 deadline, she said. "The ball at this point is in the Palestinians' court to answer these questions as to whether ... these principles would be met through that process that have been long established," she added. Pakistani military jets today pounded terrorists' positions along the Afghan border in the restive Khyber tribal region, killing at least 37 suspected militants and injuring 18 others. The suspected militants were killed as jet fighters carried out airstrikes along with a search operation in various areas of Khyber Agency. Intelligence intercepts suggest that scores of militants were killed in the airstrikes, including those suspected of involvement in recent attacks in Badbher, Charsadda, at the vegetable market in Islamabad and in Chaman, sources said. "Thirty seven terrorists have been killed and 18 others injured," a security source said. Independent verification of the death toll was not possible, as journalists are not allowed in the area. An Afghan policeman opened fire today on staff at a Kabul hospital run by a US charity, killing three Americans in the latest deadly attack targeting foreign civilians in the city. The gunman was injured in the incident outside the Cure International hospital and detained by the police, officials said, adding that the motive behind the shooting was not immediately known. 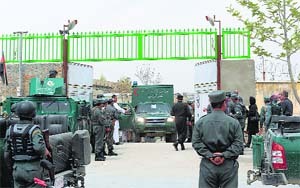 "The attacker was a member of the police in the district," Seddiq Sediqqi, spokesman for the Interior Ministry, said. "He opened fire as the foreign nationals were entering the hospital, tragically killing three and injuring another. Another policeman in the area shot the attacker, injuring him." A medic who was treating the wounded told AFP that a foreign doctor was among the dead. "With great sadness we confirm that three Americans were killed in the attack on Cure Hospital," the US embassy said on its Twitter account. "No other information will be released at this time." Cure International is a non-profit organisation founded in 1998, based in Pennsylvania and working in 29 countries, including conservative Muslim Afghanistan. * The attack came nearly three weeks after Associated Press photographer Anja Niedringhaus was killed and reporter Kathy Gannon wounded while they were sitting in the back of a car in the east of the country. * Also in March, a gunman shot dead Swedish journalist Nils Horner (51) outside a restaurant in Kabul. * Eight Afghans and 13 foreigners were killed in January when a Taliban suicide bomber and gunmen attacked a restaurant in Kabul's diplomatic district.